PROMASCOT is one of the largest designers of mascot characters in the world! 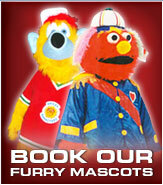 Since 1985 in Canada and 1997 in USA, PROMASCOT provides mascots around the world. and experience, bring PROMASCOT to the next level in this business. offer a LIFETIME WARRANTY to our customers. offer a service of animations worldwide by professional performers. We will give you loads of information of what impact a mascot can have on your business. provides you assurances up front that we understand your needs and objectives. samples and materials to choose from to create the perfect mascot for YOU! of the athlete while in the costume and the usability of the character. one of our qualified staff members will take care of your project mascot with professionalism. with a finalized concept which we can take to production. bringing your concept to life in the production process. giving a real-life feeling to the product, keeping you notified of our progress.
. High-quality materials are always used at PROMASCOT. Our support staff is just one more reason why PROMASCOT is successful in developing close relationships with its customers. for the development of your mascot at your location. mascot maintenance, and offer mascot training. PROMASCOT also offers world-class onsite consulting for your mascot so you can achieve the maximum success for your business!